During my two week trip to Hong Kong, I was hoping to meet one or two people and befriend them. Instead, I met about thirty people and now have friends all over the world. How did I do this? By being me! I find it is so much easier to meet and make friends with people while traveling. People’s judgments are lower and people are more easy-going and open to different ideals and personalities. It hasn’t always been easy for me to make friends, but with practice it’s become so much easier. Since I was traveling solo, I found it much easier to meet people and go with the flow. 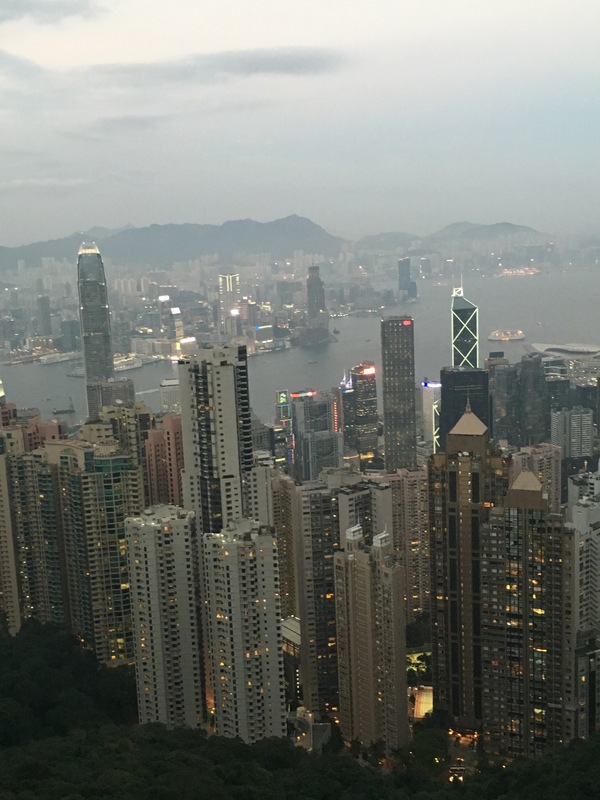 I have some crazy stories from Hong Kong, so I know you are all dying to hear about them! I flew from Boston to New York, and had a five hour layover before boarding my fifteen hour flight. I was in a terminal where there was no free wifi, and so I asked a younger girl sitting next to me if she was studying abroad. It wasn’t for a full semester, but it was for a four week class through Elon University visiting places all along the Pacific Rim. I soon met the two finance professors in charge, and talked with them for hours regarding Hong Kong, working overseas, etc. At the same time, I also met these two British guys who were in New York for holiday. We had intelligent conversations about Brexit, Trump, the economy, and not-so intelligent conversations about partying in the US vs London. I went out to Lan Kwai Fong, and I started talking to a guy at a bar. I learned he was from South Africa and in Hong Kong for a few days with his family on a return trip from Australia. In one of the first few sentences he mentioned he had taught English on a Thai island, so of course we hit it off right away. It was fun being able to converse with someone about all the places we had travelled to and wanted to visit, and it was cool meeting his family from South Africa. I love striking up conversations with people and seeing where the conversations lead. I left that night with a new Facebook friend, someone to travel Southeast Asia with, and someone to visit in South Africa! 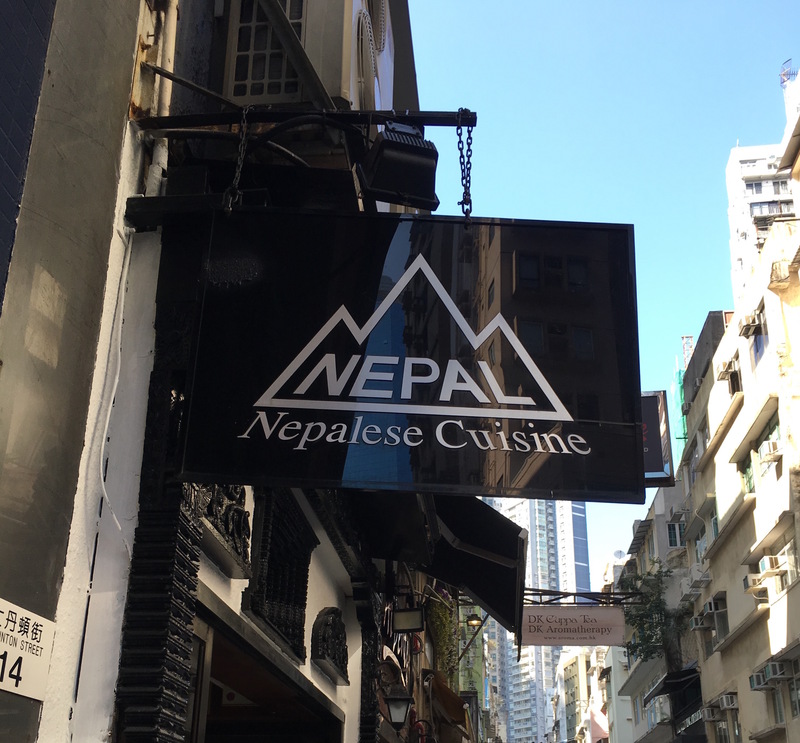 I had spent most of my third day doing tourist-type things, and knew I wanted to eat at my favorite Nepalese restaurant in Soho. I met the owner who remembered me from five years ago (SCORE) and was given a table right near the entrance (so everyone could see a young lady sitting down by herself). Soon after my meal, two men sat down next to me. They were both from Tibet, in Hong Kong for business, and knew the owner well. They gave me food to try, bought me a beer, and we discussed our new President for the USA (a frequent topic), discussed what was going on in Tibet and all the differences between Tibet, Nepal and India. I loved meeting these guys because I had never met people from Tibet, and it was an eye-opening conversation. One of the coolest groups of people I got to hang out with! I was at a local bar in Hong Kong which served over 200 different types of beer, reading my Kindle and munching on Doritos. I was about to leave when I heard American accents from these four older men, and went over and asked where they were from and what they did. They made me guess and they told me they were pilots for Cathay Pacific, based out of Los Angeles! The guys invited me out for dinner at Ho Lee Fook (a Vietnamese restaurant). I had a blast learning about everywhere they had visited and received great recommendations of where to travel to next. 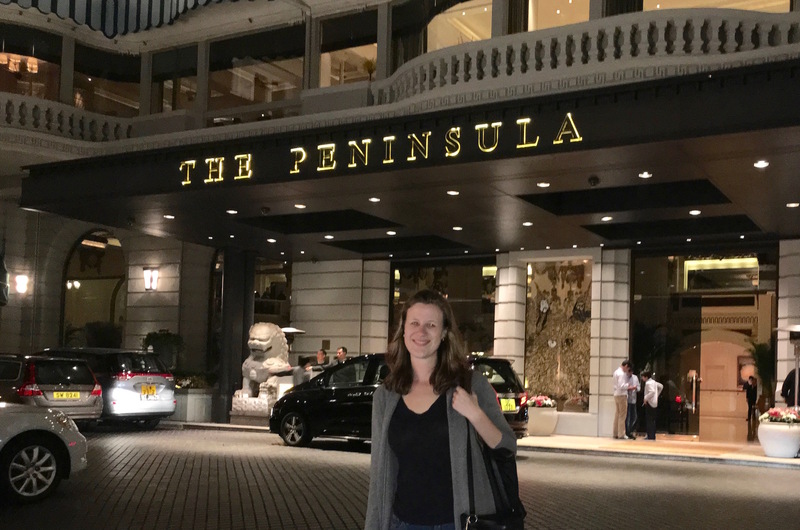 After the restaurant, we meandered our way down to The Peninsula Hotel (a place I would never have gone to on my own). We had a drink, and then went to a rooftop bar in Kowloon, which had beautiful views of the harbor. Sunday in Hong Kong I wanted to take it easy and explore one of the many islands, and thus headed out to Sharp Island. It was beautiful, and I was one of the very few white people on the island. I had debated dipping into the water since of the warm temperatures, but no one else had. Then, three white guys and an Asian girl walked right into the water. I struck up a conversation with them, learned they had gone to college in Seattle together, and went into the water as well. The three guys were doing a backpacking trip through Asia, and the girl was originally from Hong Kong and living and working there. She and I made plans to get dinner later that week, and we followed through. 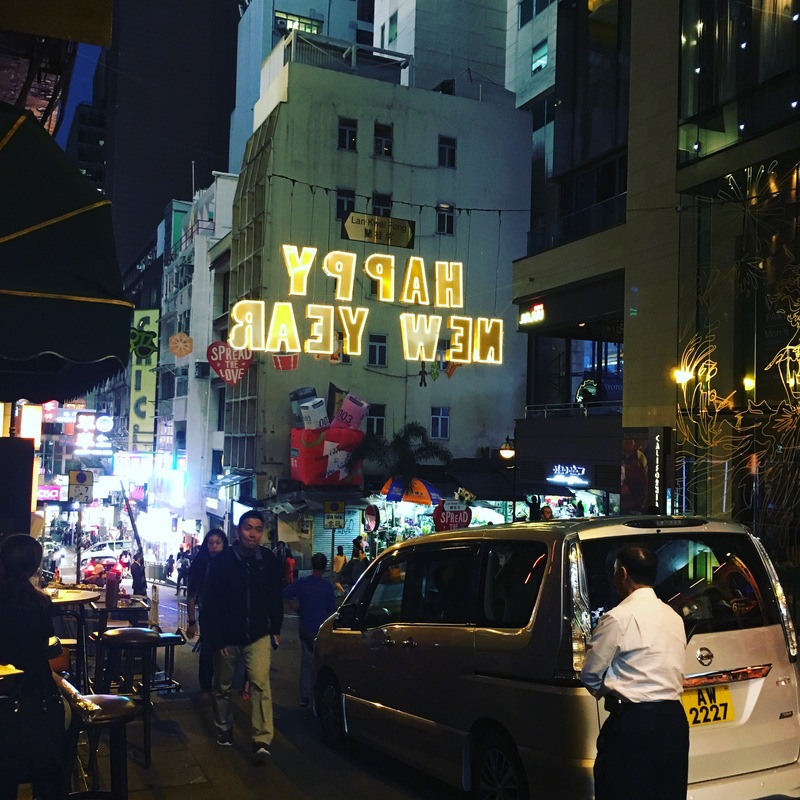 I headed over to one of my favorite bars in Hong Kong, Delaney’s, which is extremely hard to find but a hidden gem on crazy Nathan Road. I met a Kiwi who was working on the MTR rail lines, and we ended up heading to another bar with live music and meeting one of his coworkers from England. Afterwards we headed to Spicy Fingers (true name) and I met these four Finnish guys who were in Hong Kong for the toy fair. We hit it off, hung out and headed to another bar where we were able to test out their board game prototype – I give it an A+. 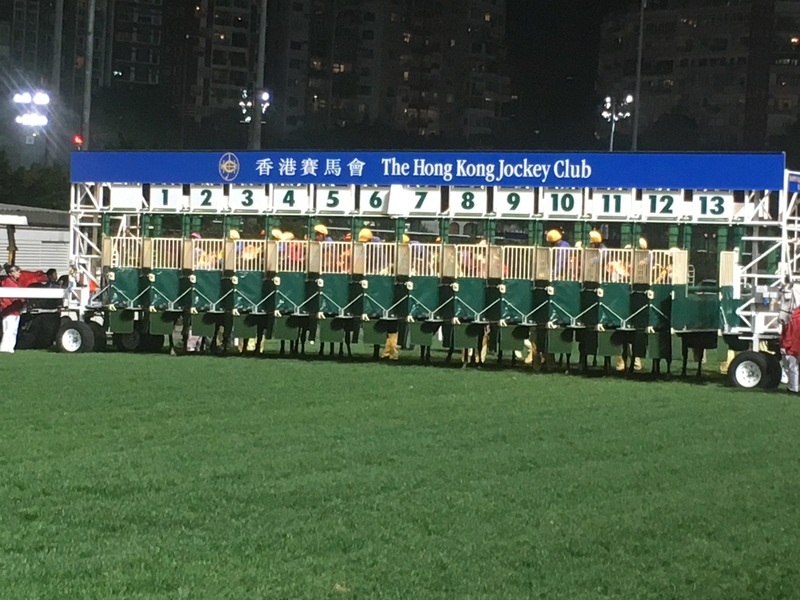 One of the things I decided to check out in Hong Kong this time around was the Happy Valley Racecourse, which I had never had any interest in checking out but did so anyways. Super cheap at 10 HKD, and super fun! I’m guessing the entire white population of Hong Kong was in attendance. An American guy and his Mom sat down next to me, and we hit it off. It was so cool meeting another American (there’s surprisingly not a lot in Hong Kong) and cool to learn he had been living there for the past four years. 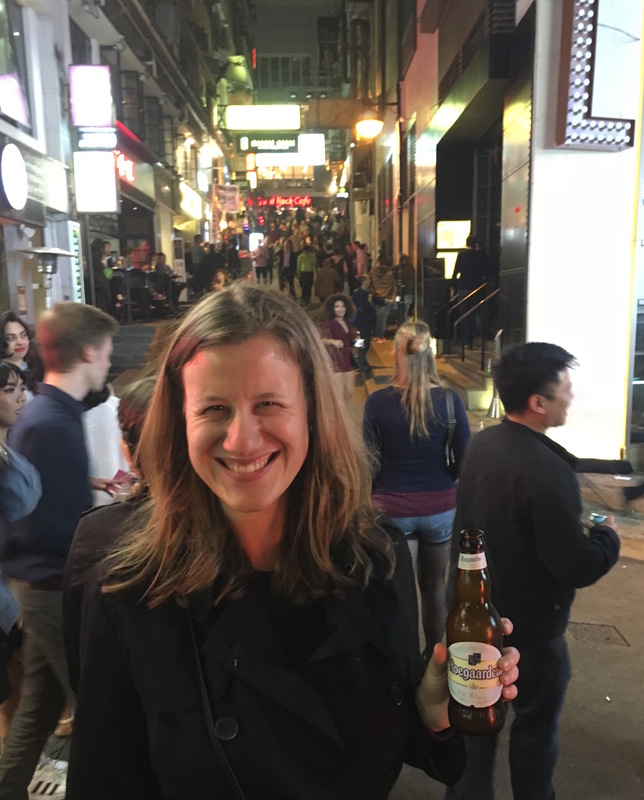 I liked being able to get a fellow Americans’ take on living in Hong Kong. So apparently I have a thing for pilots now! I went out to a bar in Lan Kwai Fong, and met people working on a cruise ship. I got free shots from the owner, and I met some Australians from Spicy Fingers earlier that week. We headed over to Insomnia where I was ushered in as Priority Status, and I met this tall Swedish pilot. My pick up line? “Hey fellow tall friend!” It was height at first sight. We headed to an awesome bar in Wan Chai, Dusk til Dawn, with a live band playing 80s music and a pizza stand next door. Staying out until five am two nights before I was scheduled to leave was a definite must! I went to the Bryan Adams concert Saturday night, and made the good decision to frequent Lan Kwai Fong one last time. The bar was crowded, so I sat down at a table where another young lady was sitting. We both found out we were visiting Hong Kong alone. It was the first time on my trip where I met another solo female traveler, and it was great! She was visiting both Hong Kong and Dubai (also on my travel wish list). As you can see, I definitely met many different types of people and had eye-opening conversations and experiences. I hung out with people my age, my parents age; people from my country and from across the world. I learned about flying planes, working on trains, the political atmosphere in different countries and more about myself. This list doesn’t even cover the Hong Kong natives I met, and the friendships I strengthened and improved upon. Traveling truly does allow you to meet people from all over the world and from different backgrounds. It is the thing I love most about traveling. Do you have any crazy or interesting stories of how you met people while traveling?